The possibility that asteroids might have satellites or even "contact binary" form has been a matter of speculation since the early discoveries of these small bodies. In the Asteroids II volume (1989), Weidenschilling et al. summarized the then inconclusive evidence in a chapter titled "Do asteroids have satellites? ", concluding that there was not a single conclusive case of an asteroidal satellite (Pluto was then still a planet). Only a little more than a decade later, in the Asteroids III volume (2002), Merline et al. presented a chapter proudly titled "Asteroids do have satellites," summarizing the properties of about 25 then-discovered binaries, including members of the main belt, near-Earth population, a Trojan, and several Trans-Neptunian Objects. Since that time, we now have discovered about 275 satellites of minor bodies of all classes, including a pair of rings around a Centaur, and numerous pairs of asteroids in extremely similar heliocentric orbits, which must be recently disintegrated binaries. This Workshop is the 4th in a series that began with the 1st Workshop in Steamboat Springs, Colorado in August 2007 and was followed by the 2nd Workshop in Poznan, Poland in July 2010 and the 3rd on Kohala Coast of Hawai'i in June/July 2013. These workshops were characterized by a relaxed atmosphere and free format, with almost as much time for discussion as for the presentations themselves. The goal of the workshop is to bring together various ideas on the detection, characterization, formation, and implications of binary and multiple objects among the NEO, main-belt, Trojan, Centaur, TNO populations. We hope to include all of the many modes of observation, in all of the dynamical populations, as well as theory and numerical modeling of formation and evolution of these systems. We especially welcome the new topics of rings of small bodies, and heliocentric orbital pairs of asteroids and their implications. To maintain the small meeting atmosphere that has made the previous Binary workshops successful, the number of participants will be capped at 50. There will be 5 half-day sessions. We also plan time and space for posters, and encourage even those making oral presentations to consider a supplemental poster to contain the more technical data and mathematics relating to an oral talk. Note on Pluto: For this workshop, we very much consider Pluto and its satellites as a "TNO" system and include it in our purview. We welcome contributions relating to the Pluto system and its relation to other TNO binary and multiple systems, but it is not our intention to focus heavily on results from the recent New Horizons mission. That could overwhelm our limited focus and facilities, and should, no doubt will, be the focus of other, larger meetings in the near future. 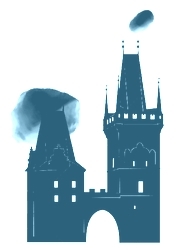 Binaries-4 will take place over 2.5 days, June 21 - 23, 2016, and will be held at Vila Lanna in Prague, Czech Republic. 14:00-18:00 - A sightseeing tour of "astronomical Prague"
A field trip to the Ries-Steinheim impact craters in Germany. The program of the meeting with times of talks specified is available here. Here are the abstracts for oral and poster presentations. The abstracts are also listed here. We plan to organize a tour of "astronomical Prague" and a post-conference field trip to the Ries and Steinheim impact craters in Germany, about a five hours drive from Prague. The town of Nordlingen, which occupies the center of the Ries Crater, is a significant tourist destination on the "Romantic Road" in Germany and well worth a day or two visit aside from the impact crater. The tour of "astronomical Prague" will include the Prague Astronomical Clock, the Kepler house, the tomb of Tycho, Clementinum, and a few other places related to the history of astronomy in Prague. We will meet on Monday June 20 at 2 pm somewhere in the city (to be specified) and we will end up before 6 pm at Vila Lanna. Participants will have to pay the entrance fee for the astronomical tower in Clementinum (220 CZK). For the field trip, we will move from Prague to Nordlingen on Thursday June 23 afternoon. Participants should get there individually by cars. We suggest to use carpooling; people going by car could offer a ride to others who will not rent car. We plan to book accommodation for participants in one or two hotels in Nordlingen for the Thursday-Friday and the Friday-Saturday night. The excursion will start in the morning of June 24 with a guided tour of the Rieskratermuseum, which should take two hours. In the afternoon we will visit quarries and outcrops of the Ries crater, guided with a geologist from the museum. On the next morning (June 25) we will drive to the Steinheim crater (with the guide), where there is a nice hiking trail (approx. 5 km) with a chance to collect shatter cones. The excursion will end on June 25 afternoon, after which the participants may go back to Prague (or to other places or airports as they need or wish), or even spend more time in Nordlingen if they like. The cost of the excursion will be about 300-400 EUR (museum entrance fee, guided tour) per whole our group, depending on a number of participants. The primary conference hotel is the venue Vila Lanna. They have 24 rooms: 13 one-bed, 2 two-bed and 9 double-bed rooms. Our special price is 910 CZK/night and 1400 CZK/night for the one- and two/double-bed rooms, respectively. Breakfast is included. They have 10 car parking places (for 150 CZK/night each). We have already booked all rooms in the Vila, it is full now. There are three suitable overflow hotels close to Vila Lanna: Penzion Na Stare Poste, Penzion Marna and PARKHOTEL Praha. They are about 200, about 800 and about 2200 meters, respectively, from Vila Lanna. Penzion Na Stare Poste lists following prices: 65 and 79 EUR/night for 2- and 3-bed room, respectively. Penzion Marna offers 4 double-bed rooms, 2 large double-bed suites, and 1 smaller double-bed suite for 1550, 1950 and 1750 CZK/night, respectively. PARKHOTEL Praha offers us following prices: 1800 and 2000 CZK/night for 1- and 2-bed rooms, respectively. Breakfast is included and car parking is available in all three hotels. We have already booked all available rooms in the overflow hotels. Vila Lanna is about 10 min by walking from Metro (the underground) station Hradcanska (Line A, the Green line). Metro is the easiest mean of public transportation in Prague. The standard one-way (90-min transfer) ticket costs 32 CZK. The all-day (24 hour) ticket costs 110 CZK. The 3-day (72 hour) ticket costs 310 CZK. The 30-day transferable ticket costs 670 CZK. You can buy tickets in ticket machines (coins needed) or in newsstands, or you can pay the transportation fee by sms (text) message if you have a Czech mobile phone card. A ticket machine on the Prague airport should also accept payment with contactless credit/debit card. Metro operates from 05:00 to 24:00 approximately. The connection finder may come in handy, especially if you wanted to use also buses or trams. Useful information on Prague public transportation tickets is available here. For transfer from/to the Prague (Vaclav Havel) airport, we recommend you to use the bus line 119 between the airport and the Metro station Nadrazi Veleslavin and the Metro line A (Green) between the stations Nadrazi Veleslavin and Hradcanska. The total transportation time should be about 40 minutes. Taxis are available but are far more expensive than the bus/metro. An alternative: Prague Airport Transfers. The participant registration form is available here. The deadline for regular registrations has already passed, but we still have a few free places so late registrations are possible. The list of registered participants is available here. The participation fee is 5400 CZK (approx. 200 EUR, or 225 USD). It covers all the events from 2016 June 20, 18:00, to June 23, 12:30, that are listed in the Workshop Schedule above. You can pay the fee at the time of registration or later. If you have already registered earlier but haven't paid the participation fee yet, and want to pay by credit/debit card now, click here. . The abstract submission form is available here. The deadline for regular abstract submission has already passed, late abstracts will be considered for poster presentations.